Place yogurt, milk, pineapple, spinach, banana, and honey into a blender. Blend on high for 30 seconds or until smooth. Taste and add additional honey if needed or a splash of milk if the consistency is too thick. Pour smoothie into serving glasses. Decorate as you see fit. Place candy eyes on top of the smoothie for eyes and use pineapple triangles for teeth. 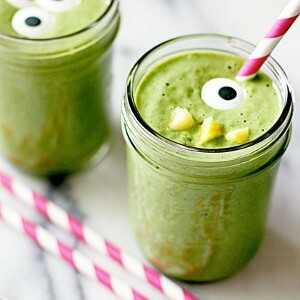 Use frozen pineapple and spinach for a colder smoothie but fresh pineapple and spinach can be substituted and will make the smoothie sweeter and greener. If using fresh pineapple and spinach, add a few ice cubes to make the smoothie colder.